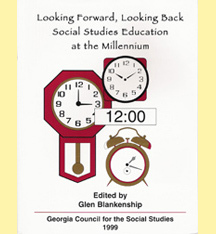 The year 1963 was a turning point in the history of social studies education in Georgia. Mr. Stan Bergquist, Georgia Department of Education; Dr. Marion Rice, University of Georgia; Mrs. Jeannette Moon, Atlanta Public Schools; and Dr. Ruby Crowe, Fulton County Schools, took the leadership in organizing the Georgia Council for the Social Sciences (GCSS) under the auspices of the Georgia Education Association (GEA). Mr. Philip Secrist, a teacher in the Marietta City Schools, was elected as the first president. 1. To secure adequate recognition for the social sciences and social studies among school curricula and programs. 2. To serve as a means of inspirational and professional growth through research, meetings, and other activities. 3. To provide means of cooperative study of programs in social science curricula and methods. 4. To disseminate information through official publications, meetings, and other means concerning the achievements, purposes, and goals of the organization. 5. 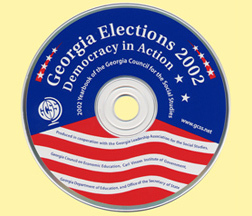 To cooperate in all ways possible with other professional organizations, the Georgia Department of Education, and local schools to improve the quality of education in Georgia schools. 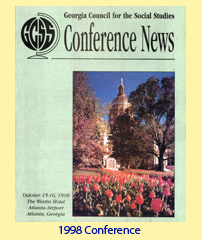 The first conference of the Georgia Council for the Sciences was held at Rock Eagle, in 1964, and these meetings were held in February each year until the mid 1970s when the conference date shifted to October. By 1966, GCSS was in a strong enough position to incorporate as a non-profit education organization. 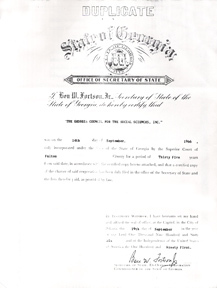 Largely through the work of Stan Bergquist, the social studies coordinator at the Georgia Department of Education [1965-1971], the Council was incorporated on September 14, 1966, and received tax exempt status in 1968. 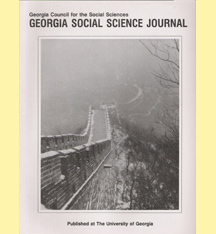 In 1969, the Council began publication of the Georgia Social Science Journal. 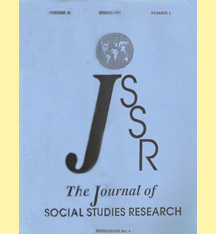 A second series, the Journal of Social Science Research, was added later. With one publication focusing on research and one on practical applications in the classroom, the GCSS membership was the beneficiary of a powerful publications program. The journals were published until 1993. Other publications provided to the membership replaced the journal. Yearbooks on various subjects including the electoral process technology, and action research keep members up-to-date on topics of interest. In the fall of 1972, the Council began publication of the quarterly newsletter News and Notes. The newsletter continues uninterrupted to today. 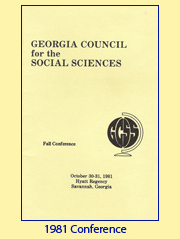 In 1981, the Council changed its name from the Georgia Council for the Social Sciences to the Georgia Council for the Social Studies. This move was made to more closely align GCSS with the National Council for the Social Studies. 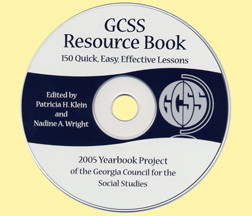 A leadership conference was established in 1981 by Gwen Hutcheson at the Georgia Department of Education [1971-1993], in collaboration with GCSS. This bi-annual meeting was designed to address the needs of people in social studies leadership positions such as social studies supervisors, social studies department chairs, and central office personnel across the state. 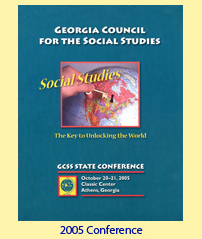 Today, this conference is a function of the Georgia Leadership Association of the Social Studies [GLASS], founded in 1990. 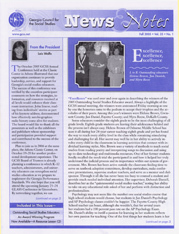 In 1981, GCSS began the Outstanding Social Studies Educator award, an annual program to honor Council members who have distinguished themselves in their field. In 2009, the name of this award was changed toGwen Hutcheson Outstanding Educator award. 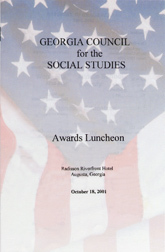 In 1990, GCSS launched the Programs of Excellence award to recognize Georgia schools for outstanding social studies programs. In 1995, the Council's Board of Trustees authorized the Berryman Service Award Given in memory of Dr. Charles Berryman, long-time executive director of GCSS, the award recognizes individuals who have made significant ongoing contributions to GCSS and the social studies profession. In addition to these three awards, several other awards (such as the GCSS President's Award) are periodically given to honor special individuals. All awards are presented each year during the Awards Luncheon at the GCSS conference. Today GCSS is served by a large elected Board of Trustees, who oversee a staff of professionals who guide the organization ­ an executive director, a conference coordinator, a secretary/newsletter editor, a webmaster, a social studies fair director, and a historian. We all look forward to the next 40 years of growth and advancement of social studies education.